We arrived to wet and dark Tallinn around 10:30pm in Friday, and started the slow and bumpy progress towards Pärnu. 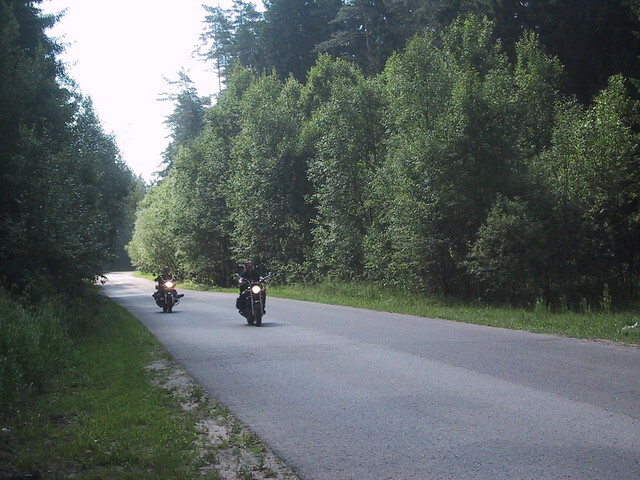 The effect of EU funding on the Via Baltica (E67) road we’re apparent, as road was under construction in many places. Unfortunately for us this mean removed tarmac and lots of potholes. Addition to this fun was crazy Mercedes and Audi drivers and drunken teenagers jumping to the road. However, we made it safely to the Uudea guesthouse near Pärnu, a place run by Skoll’s family. The storm pestering Finland on the previous night had hit Estonia even more viciously, and the roads were filled with debris from fallen trees. Electricity had been out for two days, and so water was sparse. However, we made ourselves comfortable by putting gear to dry, setting up a fire, and sitting down to drink local Saku beer and chatting long into morning. The next morning, or to be honest early afternoon started bright and warm, and we got some workout from chopping up two huge trees that had fallen in the storm from Skoll’s grandmothers backyard. We also had a pleasant swim in the nearby warm if muddy stream. After lunch we set out to Pärnu’s center. Pärnu is a nice, small city filled with low wooden buildings and surprisingly few remnants of the soviet regime. We cruised around the city for a while and visited the long sand beach. 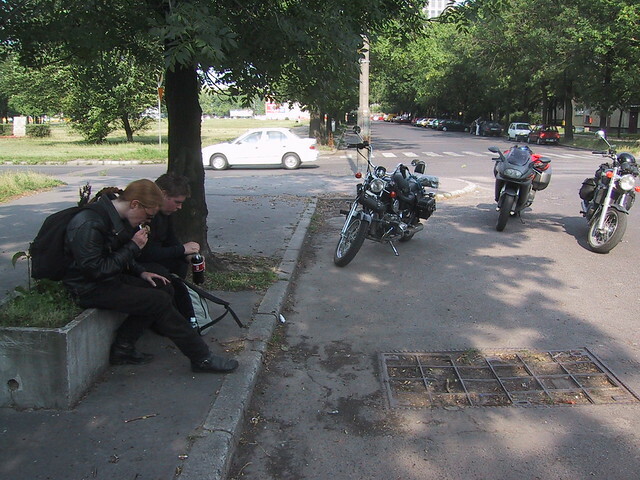 We also managed to find the local biker-styled rock bar Pub Alexanderis, which seemed to also serve pretty good food. Since we had our bikes with us, we decided to withdraw back to the gueshouse for sauna and beer. Skoll went to visit some other family members in the following morning, and we stayed with Rambo in attempt to get image uploads to the travel server working. FTPing the images over GSM data seemed to work, but took about 13 minutes per each image and costing something horrondous. We also tried GPRS connection, but since it is NATted we couldn’t get FTP working. The next thing we’ll try is uploading the images over Psion’s web browser. Once Skoll gets back, the plan is to spend the night at Pub Alexanderis. 10 July 2002 in Augustow, Poland. 1 minute read. We left Pärnu on monday morning and started the slow progress towards Riga. The main roads here have very low speed limits, ranging from 60 to 90 km/h. Of course, anything faster would probably have been uncomfortable on Skoll’s Ural. 15 July 2002 in Prague, Czech Republic. 4 minute read.